We are almost there! All the big stuff has been done, though we are still awaiting delivery of the bar, which should happen tomorrow. Some of the furniture from storage has already reached Goldhawk Road and more is being brought in today. A lot of tidying up is still needed, but we are all looking forward to Friday and the g rand opening. 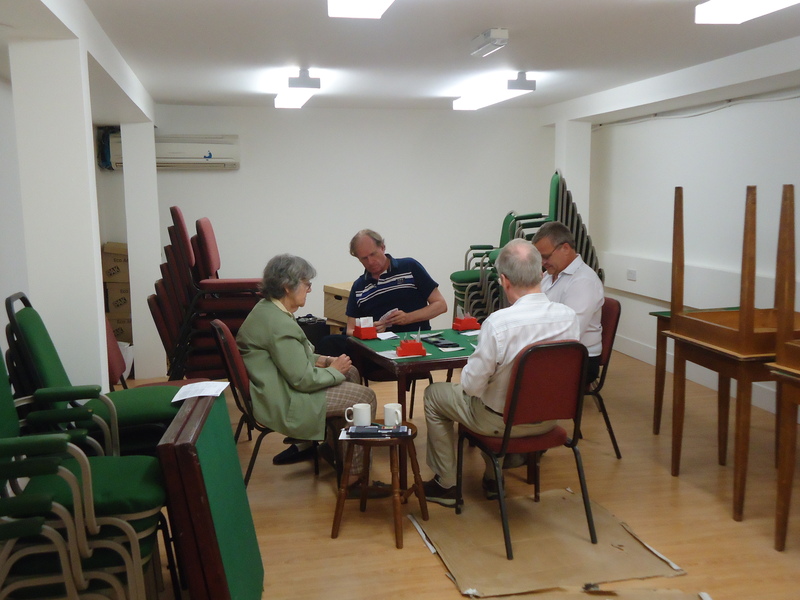 There was however a first game played at the new premises last night – a Silver Plate match between two teams both with YC members. One table was set up in the teaching room area, and one on the match roo m area – the pictures (right) show both tables in play. So the premises have been officially christened! 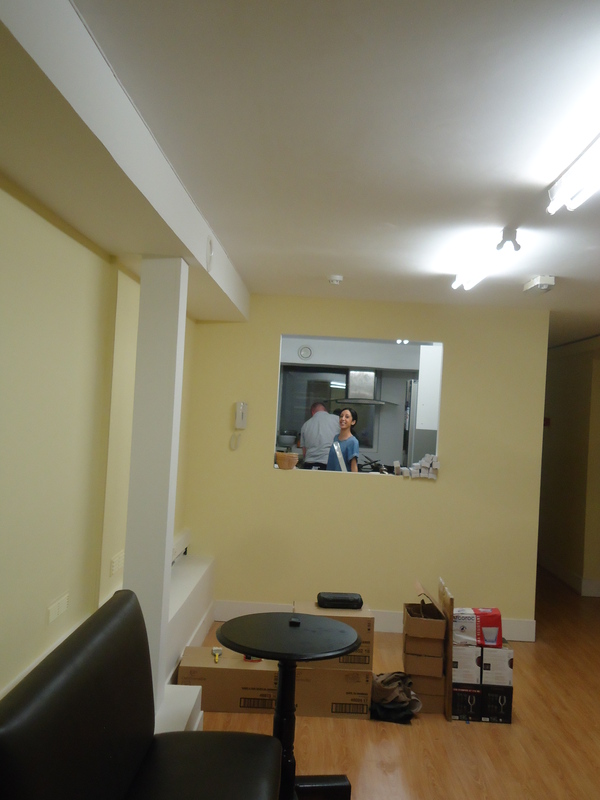 One more picture (left) shows Nick and Sophia working in the new kitchen. 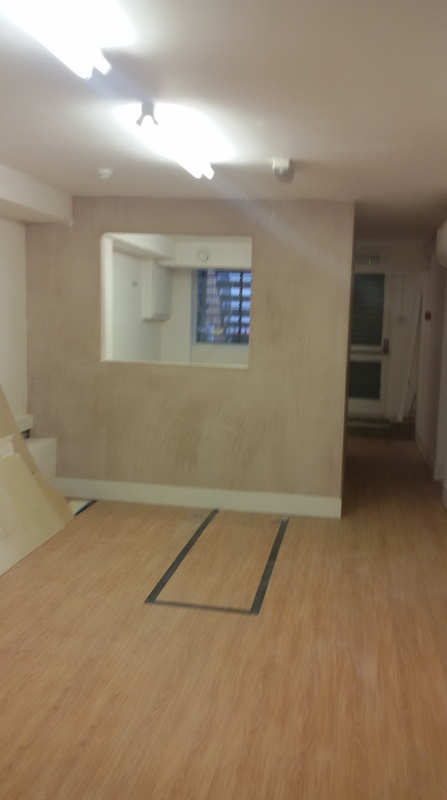 The new bar will be fitted where the cardboard boxes are lined up and the big hatch will connect the kitchen to the bar. These are exciting times – the final fruition of a very long-held dream! Looking forward to seeing you all on Friday. I am pleased to say that we can now confirm that the first game at the new premises will be on Friday 17th July. There will be a glass of bubbly for everyone who comes along, and the duplicate will be free for all. I think you will all be really pleased with the space and facilities, and even if one or two details are not completely finished I’m sure you won’t notice..If you can’t make 17th, then come any Monday, Wednesday or Friday evening for the usual duplicates, which will all be free in July. The refit is mostly on schedule.The painting of the walls is in progress, one of the last stages to be tackled. The new bar won’t be delivered until Wednesday 14th, but as long as the promised delivery happens then we should be ok to get it stocked up in time for Friday! Everything else is well in hand – furniture and equipment that has been in storage is gradually being brought to the club and new equipment etc is all in the pipe-line. Nick and I are both off to Tromso tomorrow for a week, but things will continue in our absence. The last few days after we are back and before we open will be hectic, with all the final details of sprucing up the decor, setting up notice boards etc to be tackled. We have a big new sign which will be attached to the outside of the building so you can find us easily when you come. 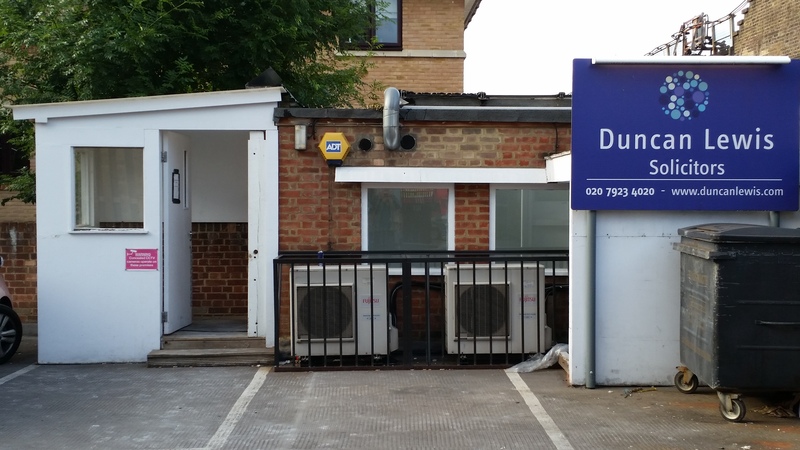 A reminder that the new address of the club is 54 Goldhawk Road, W12 8HA. The entrance is set back from the road behind a Sainsbury’s Local store, directly opposite Goldhawk Road tube station. You can also easily reach the club via the overground or Central line to Shepherds Bush station, about a 10 minute walk away across the Green. Buses 94 and 237 go along Goldhawk Road and stop right outside the premises and the 94 is a 24-hour service. Numerous other bus routes also serve the Shepherds Bush area. If coming by car, the pay-and-display bays in the roads to the south of Goldhawk Road are mostly free after 5.00pm and there are plenty of single yellow lines that are also free in the evenings. But do please check the signs, as some of the nearby roads have pay-and-display bays which become residents only between 6.30pm and 8.00pm, so if you use one of these you will get a ticket.. Be careful! The construction work is now largely finished, barring a few details, and the decorating is under way. The ceiling in the main room has been painted with a light enhancing white and it looks nice and bright. The kitchen has had walls and ceiling painted and is fitted out with cooker, fridge-freezer, a small fridge, a sink and a dishwasher. 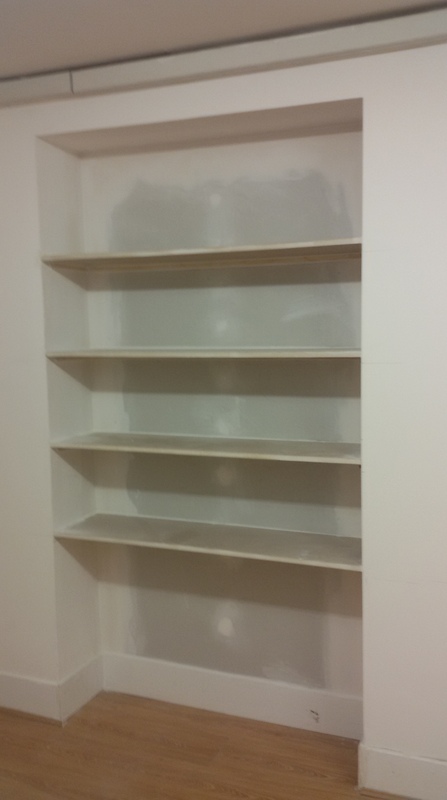 Other plastered areas have been primed and most are ready for paint. 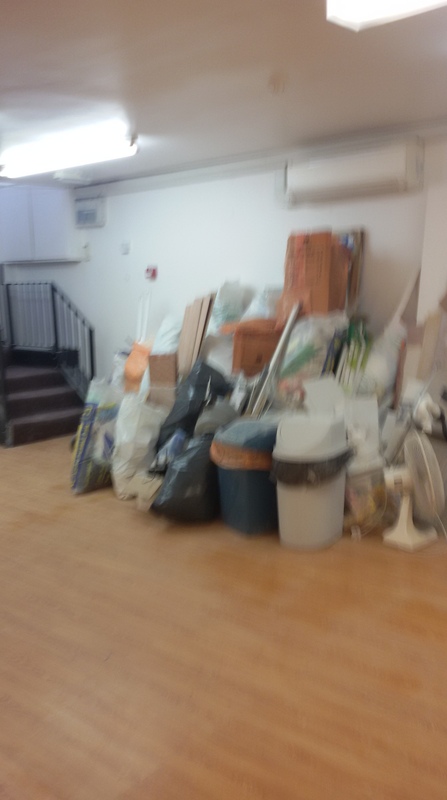 The back match rooms are next to be painted, as there’s now a door to keep the dust out, followed by the disabled toilet, the teaching rooms and the main playing area – when the rubbish is gone (see picture!). Doors and skirting boards will be painted with white gloss. A lot of the eyesores have been sorted; trunking has been put over most of the visible wiring, holes have been filled and unnecessary wiring cut. Stuff from Barkston Gardens that has been in storage will be arriving shortly. The round tables and the couches from the bar will be spruced up and used in the new bar, and bridge tables and chairs will be coming in. We hope the new physical bar will be delivered shortly. Nick is off soon to go to the European Open championships in Tromso, but while he is away, Sophia and Andreas will be in charge, setting up the rooms and cleaning everything – cloths, chairs, boards, boxes etc. For those of you who don’t know them, Sophia will be our main person in charge of the bar, and her father, Andreas, will be our chef. I’m currently in Spain and am off to Tromso as well for a week after my return. So lots of finishing off will happen during the last week when we are both back. There are bound to be a few things that aren’t quite right when we open, but the Management Committee is very hopeful of wowing everyone when you come along. 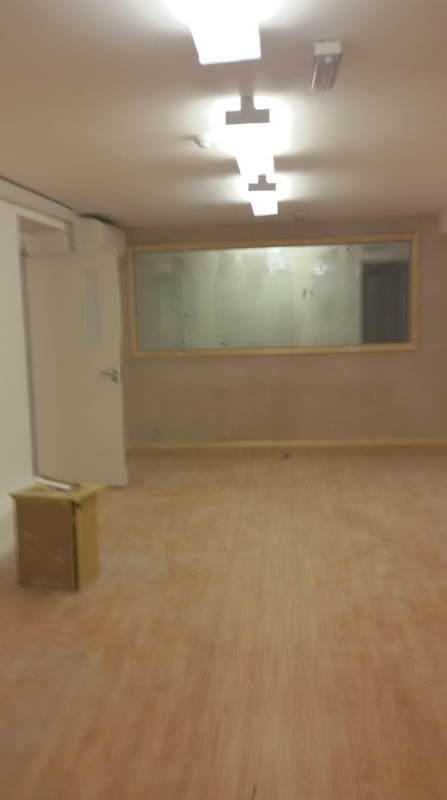 I promised you some up-to-date pictures of the new premises, so here they are. This is the entrance to the premises, taken from the car-park area behind Sainsbury’s. A Young Chelsea Bridge Club sign has been ordered to replace the Duncan Lewis one, and will be clearly visible from the street. These two pics are taken in the bar area. On the right you can see the new kitchen that has been built and on the left are the bookshelves that will hold the library. In the pics below, you can see the corridor between the main playing area and the bar, and a view from inside the teaching rooms. Sorry the photos aren’t very good,but they should give you an idea of how things are shaping up. I’m pleased to say that the problem with the drain has been resolved. It turned out there was a large block of concrete blocking the pipe, which has now been removed. The drain is clearing normally and we are back on course with progressing the kitchen etc. Most of the construction work has now been done.The kitchen walls, and the wall between the teaching rooms and the corridor are finished and the glass in the big window in the latter has been fitted. The storage area is virtually finished, and the disabled toilet.has been tiled. Cabinets, worktops, a range cooker and other appliances have been ordered for the kitchen, and new wash-basins for the toilets are on their way. A new motor has been found for the air intake, as the old one was very noisy – the air conditioning now seems to be working well. The premises were well lit already with strip lighting which is effective but ugly. Diffusers to cover these have been ordered – they will look better and the lighting should still be plenty bright enough for bridge play. Other bits and pieces that have arrived, or will do so shortly, are new toilet seats, notice boards, white boards, fire exit signage, electrical trunking, coat hangers, shelving for the storage.and a couple of desks – one for a reception area near the entrance and one to be tucked away in one of the teaching rooms where the board dealing will be done. We are currently looking at how best to provide folding partition walls to divide the teaching rooms and the match rooms. Made-to-measure panels are prohibitively costly, but we believe we can use ready-made partitioning by building a wall into which it will fit. There is no particular urgency for these, as teaching will not start in earnest until September, so we can consider our options a bit further before committing to one solution. The other outstanding issue is the form of bar we should install. There is not a big choice out there, but we think we have hit upon one that will work for us. I’m visiting the premises again tomorrow, so will aim to take some more photos then to show you the progress that has been made. Great news! We’ve set a date for moving in – though it is still provisional. That’s because things can still go wrong and unexpected problems can arise. For example, whilst constructing the new kitchen, the builders discovered there was a manhole just outside the kitchen area from which foul water was continually threatening to seep into the building. Dyno-Rod was called in but couldn’t clear the blockage in the drain, or even be certain that that was what was causing the problem.They are coming back later this week with more sophisticated equipment and hopefully will resolve things then. We are not even sure the manhole or drain are part of our property, but the problem is definitely ours and has to be dealt with. So 17th July, if all goes well, which is a Friday. There will be the usual Friday game plus some champagne and refreshments to help with the celebrations. We do hope to see many old friends then and during the following weeks. All the sessions in July will be free of charge, so it will be a good time to visit. We plan to run with the regular Monday/Wednesday/Friday duplicates initially, then to re-start the other evening games and some afternoon ones in September, after the holiday season. Other planned activities include a couple of open days in August, when local residents and others will be able to visit the club, see what we are about and hopefully sign up for courses; and also a re-vamp of the website so it is sparkling and new when we open at the new site. We need to make sure too that online search engines direct people to the right location – some still point to 32 Barkston Gardens. If anyone has expertise in this area, please get in touch as we could do with help with this task. The electrician has finished his work, and the plumber has installed the water pipe for the kitchen. The pillars have been boxed up and all the surfaces made even, so the main room is almost ready to be painted. The rest of the construction work this last week has been a bit slower than we’d hoped. 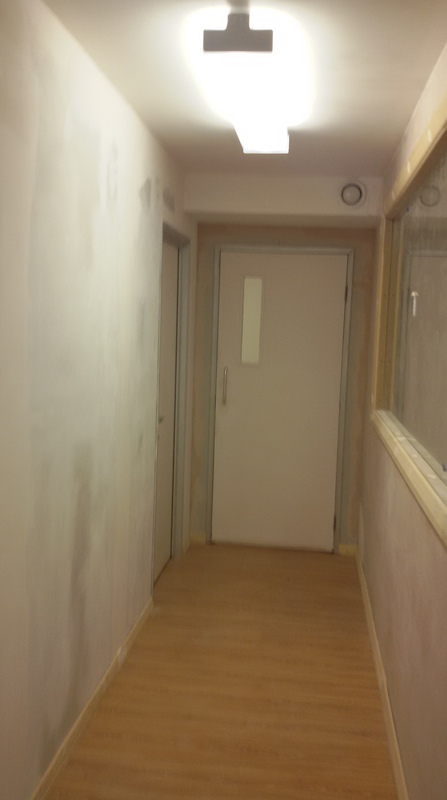 The doors to the playing rooms are now in, however, and the wall between the corridor and the playing rooms is almost finished. There is now a broom cupboard in the corridor that leads to the toilets and bookshelves have been put up in the bar that will house the club’s library of books and magazines. The next step is construction of the kitchen. We have another meeting of the Management Committee tomorrow and I am hoping we will be able to set an opening date then – at least a provisional one. We have designed a survey form which we will ask everyone who comes along to the new premises to complete. At present the Management Committee has to make practical decisions in order to progress things, but we do want to make sure we meet people’s needs. So the survey, as well as giving us some factual information such as details of how people will travel to and from the club, will give everyone the opportunity to comment on the facilities and what they would like to see. I don’t suppose we will be able to satisfy everyone’s demands, but at least we can try!